, brother of the preceding, was the seventh and youngest son of the archbishop of York, and was born at the archiepiscopal pala.ce of Bishopthorp in 1577. In 1588 he was sent to Oxford, and matriculated of St. Mary Hall. Wood is of opinion, that he afterwards removed to Corpus-Christi-coilege. How iang he resided in the university, or whether he took a degree, does not appear. In August 16 10, remarkable for the murder of king Henry IV“. of France, Mr. Sandys set out on his travels, and, in the course of. two years, made an extensive tour, having visited several parts of Europe, and many cities and countries of the East, as Constantinople, Greece, Egypt, and the Holy Land; after which, taking a view of the remote parts of Italy, he went to Rome and Venice, and, on his return, after properly digesting the observations he had made, published, in 1615, his well-known folio, the title of the 7th edition of which, in 1673, is,” Sandys* Travels, containing an history of the original and present state of the Turkish empire; their laws, government, policy, military force, courts of justice, and commerce. The Ma-^ hometan religion and ceremonies. A description of Constantinople, the grand signior’s seraglio, and his manner of living: also of Greece, with the religion and customs of the Grecians. Of Egypt; the antiquity, hieroglyphics, rites, customs, discipline, and religion, of the Egyptians, A voyage on the river Nilus. Of Armenia, Grand Cairo, Rhodes, the Pyramides, Colossus: the former flourishing and present state of Alexandria. A description of the Holy Land, of the Jews, and several sects of Christians Jiving there; of Jerusalem, Sepulchre of Christ, Temple of Solomon, and what else, either of antiquity orworth observation. Lastly, Italy described, and the islands adjoining; as Cyprus, Crete, Malta, Sicilia, the Eolian islands; of Rome, Venice, Naples, Syracusa, Mesena, jEtna, Scylla, and Charybdis; and other places of note. Illustrated with | fifty maps and figures.“Most of the plates, especially those relating to Jerusalem and the Holy Land, are copied from the” Devotissimo Viaggio di Zualiardo, Roma,“1587, 4to. Of these travels there have been eight or ten editions published, and it still bears its reputation, his accounts having been verified by subsequent travellers. 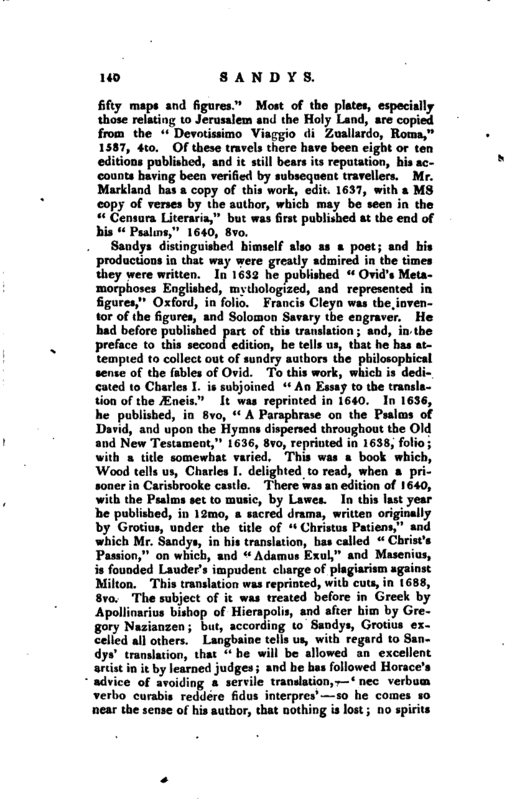 Mr. Markland has a copy of this work, edit. 1637, with a ms copy of verses by the author, which may be seen in the *’ Censura Literaria,” but was first published at the end of his “Psalms,” 1640, 8vo. Ath. Ox. vol. II. Gibber’s Lives. Fuller’s Worthies. Censura Lit. vote. IV. and V. Ellis’s Specimens, vol. III. 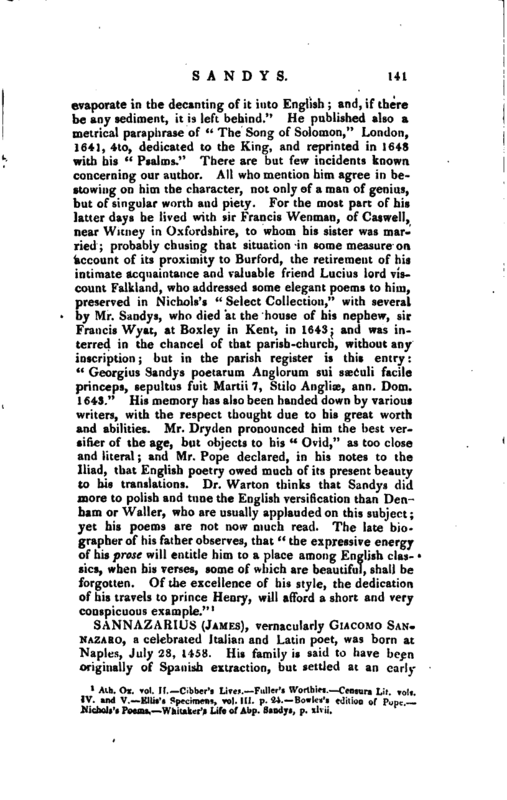 p. 24.~Bowles’s edition of Pope.-. Nichols’s Poems. Whitaker’s Life of Aby. 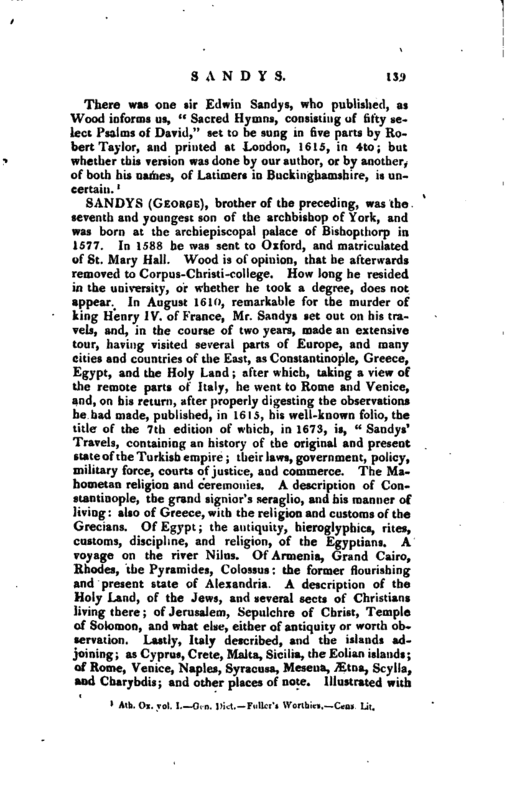 Sandys, p. xlvii.